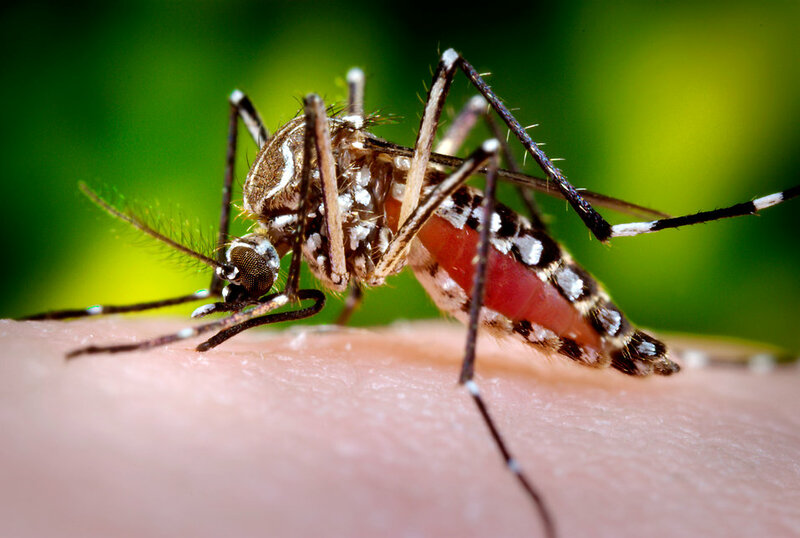 Description: This 2006 photograph depicted a female Aedes aegypti mosquito while she was in the process of acquiring a blood meal from her human host, who in this instance, was actually the biomedical photographer, James Gathany, here at the Centers for Disease Control. The feeding apparatus consisted of a sharp, orange-colored 'fascicle' that was covered in a soft, pliant sheath called the 'labellum' while not feeding. The labellum was shown here retracted as the sharp 'stylets' contained within pierced the host's skin surface, thereby, allowing the insect to obtain its blood meal. The orange color of the fascicle was due to the red color of the blood as it migrated up the thin, sharp translucent tube. When viewed in cross-section, the larger of the two needle-sharp stylets, known as the 'labrum', takes on the shape of an inverted 'V', and acts as a gutter, which directs the ingested host blood towards the insect's mouth.